If you’re like most people, then you’re probably looking into building a chicken coop on a budget. I know, I know, money is tight and you don’t want to break the bank just by building a chicken coop. The good news is you don’t have to. Due to the competing lumber and hardware markets, there are a variety of different materials and building options available to you that you should keep in mind so that you can have the coop you want for as little money as possible. Many first time builders spend too much money on what they think they need instead of what they actually need to build their chicken coop. If they would have known these few money-saving tips they could have saved a ton of money and a lot of headaches. This would seem like a no-brainer, but you’d we surprised at the number of people pick a random spot, without any thought, and start to build. What ends up happening is that they run into big trouble down then road. It could be as building in the wrong direction or a big as building in a flood area. Either way a little planning before hand would have saved them a lot of trouble. So, the first thing to do is scout the land you have available to build on. Since most properties are not setup for building a chicken coop, you most likely will have to do a bit of landscaping before building. Ultimately, the best option is to just find an area where you don’t need to landscape. It won’t be easy, but once you find it you’ll be happy you did. A window is just a hole that lets in air and light, right? WRONG! 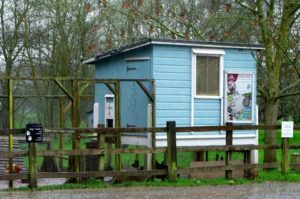 Windows can make or break you chicken coop. Windows serve as your chicken’s primary light source; which is important because chickens thrive in a well lit area. So instead of installing artificial light, which will cost a bundle, let Mother Nature supply all the light you coop needs for free. Also, windows are necessary for ventilation. Ventilation is important because it is the number one overlooked aspect for helping keep healthy chickens. Make sure the windows are positioned so they will catch a good cross breeze. 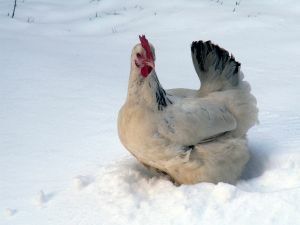 This will air out the coop and keep it cool- which will save you a lot of money in the long run. 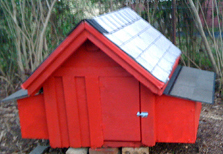 A third, and painfully obvious, way to save money while building a chicken coop is to build a smaller coop. The less you build the less you spend on building. Unless your plans are to become the next biggest commercial egg farm, you’re only going to need a coop big enough to house two or three chickens. There’s no need to build a bigger coop unless you absolutely have to. Hank Dodson is the owner of The Chicken Coop Plans Site. Hank has been building chicken coops and caring for chicken for decades. 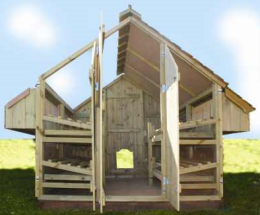 Want to learn more about building a chicken coop? 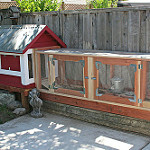 Visit his building a chicken coop site for helpful tips and information on how to build you very own coop.